OLD SAYBROOK – State Senator Paul Formica (R-East Lyme) joined the Connecticut Port Authority alongside state and local officials on Nov. 14 to announce the start of the North Cove dredging project in Old Saybrook. At a press conference at the Vicky Duffy Pavilion at Saybrook Point, officials detailed the project, overseen by the U.S. Army Corps of Engineers, intended to boost maritime activity and business in the Old Saybrook area. The North Cove Federal Navigation Dredging Project will remove 290,000 cubic yards of fine grain sediments to restore the width and depth authorized throughout the cove and its entrance channel. 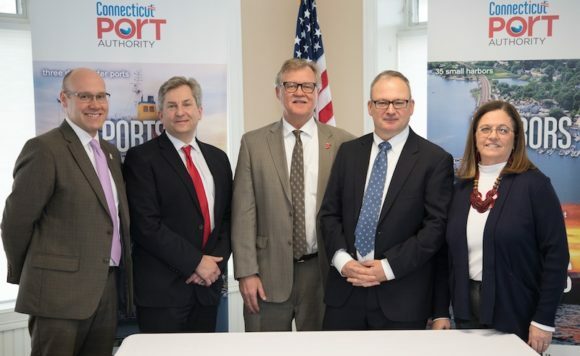 The Connecticut Port Authority will invest $4.3 million in this project to make all moorings available for use and increase vessel safety and access to the cove at all tide levels. According to the Connecticut Port Authority, river flows and natural tidal actions have deposited significant shoals in both the cove and the channels, in some areas reducing depth to as little as 4 feet. The entrance channel is authorized to 11 feet and the anchorage area is authorized to both 11 feet and 6 feet at different locations. All three areas will be restored to their authorized levels. The dredged material has been analyzed and determined suitable for deposit in the Central Long Island Sound Disposal Site. The Connecticut Port Authority was created in 2014 that is responsible for marketing and coordinating the development of the state’s ports and maritime economy.